I hope everyone in the US had a great Thanksgiving. Today, I am sooo excited to take part in the "Dragon and Dangerous Princess" blog tour with authors Jim Averbeck and Dashka Slater. My kidlets and I have been fans of theirs for a few years, and we read their books often. Check out my review of Jim's In a Blue Room and Dashka's The Sea Serpent and Me. Now, the two are back with two WONDERFUL picture books that would make perfect gifts for the little readers in your life! First, Oh No, Little Dragon! is both written and illustrated by Jim Averbeck. In the book, the super energetic Little Dragon is super mischievous and gets himself into funny antics that had my littles laughing out loud. Through a funny story and adorable illustrations, Jim Averbeck successfully weaves in the overarching theme of a mother's love for her child. In 2008, you visited The Well-Read Child to talk about your first book, In a Blue Room. What have you been up to since then? A lot! I was honored to illustrate a book for Linda Sue Park called A Long Walk to Water. It was a serial novel that appeared in newspapers. Then I both wrote and illustrated Except If which came out last year. Then, of course, this year I finished Oh No, Little Dragon! Where did you get the idea for Oh No, Little Dragon? It started with the name of the character. When I was traveling in China, my guide’s name was Xiao Long, which he said meant “Little Dragon.” I thought that sounded like a fun name for a character in a picture book and I spent the rest of the vacation thinking about it. When I was taking a shower in the hotel, I swallowed some water and started coughing. That got me to thinking about what would happen if a dragon swallowed water. The story grew from there. I have two rambunctious “little dragons” in my house. 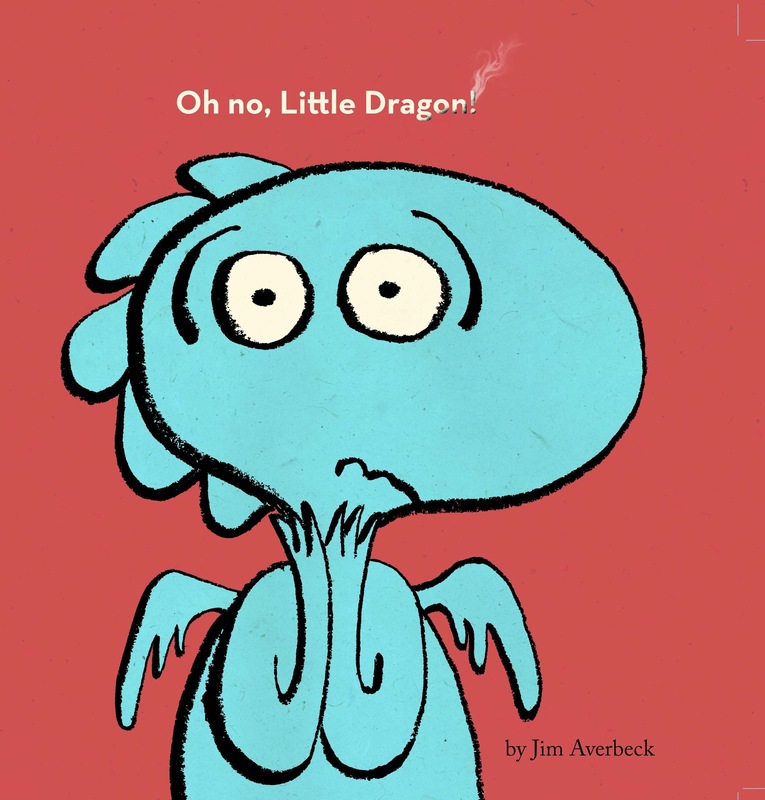 Is the Little Dragon character based on anyone in your life or maybe yourself when you were a kid? I think I’d have to own the title “rambunctious child” much to my mother’s chagrin. One year I was so rambunctious that I broke my arm three times in the space of twelve months. The police actually had to investigate my home life, for fear that I was being abused. My poor mother, pinned under the unwavering gaze of the law! I’m sure when I told the police how I liked to play “tightrope walker” on the narrow pipe at the top of the swing set, or “paratrooper” from the top of the apple tree, they decided my mom was innocent. Besides dragons, I would have to say pegasuses. Or is that pegasi? Anyway- winged horses. They seem like the most useful of mythical creatures, good for traveling long distances, carrying heavy loads, easy to stable and feed. But in honesty, I’d just as soon stick with my plain old, non-mythical pet dog Bella, who is licking my arm as I type this response. You are an author AND an illustrator. What do you love most about writing and illustrating your own books? The interplay of words and pictures. I love the ability to tell a large part of the story with the art. 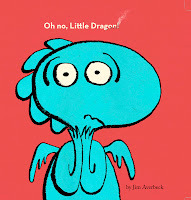 For example, the last image of Oh No, Little Dragon lets us know that Little Dragon has learned a thing or two from his adventure in the book, but it isn’t stated explicitly. It’s all in the visual. So, telling much of the story with the art let’s me concentrate on picking only the best words, since I will need so few of them. What do you love most about writing for children? I think I love the way it keeps me connected to my own inner child. It enables me to continue to view the world with a sense of wonder, and get paid for it! Why do you think it’s important for adults to read with the children in their lives? For most people, their world doesn’t extend too far past the place they were born. Reading is really the only way to open the world up for them, to expose them to different cultures and ideas. Children need to have reading modeled as an activity that’s good, worthwhile and enjoyable, so they can become readers for life. The best way for that to happen is for the adults in their life to read to them or with them. An adult who reads to a child is giving them the world. A lot of people ask for tips about turning reluctant readers into lifelong readers. Do you have any suggestions? Start with their interests and work outward. So, for example, if your reluctant reader likes Spiderman movies, go out and buy him a trade paperback of a good Spiderman story arc. Or if he likes sports, get him a biography of a top player. Look for any inroad you can find. And even if one book doesn’t pique his interest, keep looking. Also- be sure to buy age appropriate books. If you buy books too advanced for your reluctant reader, he may lose interest. Keep feeding that interest then branch out. So from Spiderman, introduce him to other great graphic novels, working up to ones with more depth. And then maybe to books that deal with similar subject matter- fantasy etc. I think the important thing is to use their interests to guide what books to give them, rather than trying to use books to interest them in something they don’t care about. What kinds of things do you like to do when you’re not writing or illustrating? I’m a city boy. I’ve lived in metro areas since I was 18. Recently my partner and I decided we needed to spend at least three nights each week enjoying the city of San Francisco. I like to find weird little performance venues for an evening of cheap, unusual entertainment. So I guess one answer is “nightlife.” I also like to run on the beach with my dog, work out, hang out with friends and explore the great restaurants here in the city. My next book to be published will be The Market Bowl. It’s an original folktale set in Cameroon, where I was a Peace Corps Volunteer. I was recently informed that it is a Junior Library Guild Selection, which is great news. It’s the story of Yoyo, who loses the blessing on the bowl her family uses to collect money for the goods they sell at market. No blessing means no money, so she has to find a way to get that blessing restored. I’ve also written a novel called A Hitch at the Fairmont which my agent is currently presenting to editors. Several are interested, so I expect it to sell soon. features a really tough Princess named Amanita. Princess Amanita loves to do dangerous things, and when her neighbor Prince Florian gives her a bouquet of roses, she scoffs until she sees that they have thorns. She wants to grow rose seeds of her own, but instead of roses, she grows really loud, sneezing, sniffling noses that threaten the peace of the kingdom. So Amanita sets out on a dangerous adventure to get rid of the noses. 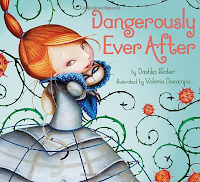 I really love this story of an "unconventional" princess with a taste for adventure. 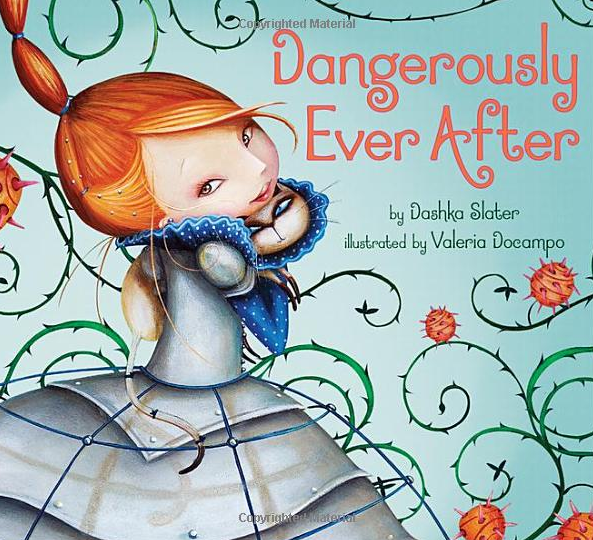 Where did you get the idea for Dangerously Ever After? When my son was in first grade, he announced that he had a funny idea for a story about a queen who wanted to plant rose seeds and ended up planting nose seeds. As soon as he described it to me, I could picture the hilarious possibilities that could ensue – Sneezing! Snoring! Snot! For days I pestered him to write the story himself, but he never did. Then I was forced to wrestle with the ethics of stealing story ideas from a small child, particularly my own. At last I sat down with him and suggested we write it together. He was mildly interested in the project, but eventually wandered off to build something with blocks, leaving me to finish it on my own. Princess Amanita is a pretty tough little princess. Why do you think it’s important for children’s books to have strong female characters? Children’s books are all about possibility – they allow children to try on different personalities and imagine themselves living through different scenarios. And while the words “role model” have been so overused as to have lost their meaning, I think it’s important for children of every variety to be able to see themselves as strong and capable and even a little dangerous – and that means that there have to be stories featuring strong, capable and dangerous girls. One of the surprising things I’ve discovered is that boys love Dangerously Ever After. I never set out to write a princess book for boys, and yet I keep getting letters from parents telling me that their sons can’t get enough of it. I love that because conventional wisdom has it that boys won’t read books about girls. Are Princess Amanita and Prince Florian based on real people in your life? My son had a friend in elementary school who was very much a dangerous princess. She dressed like a goth in kindergarten and was profoundly attracted to anything with a whiff or risk to it. I have a very vivid memory of standing mortified in the supermarket as she loudly announced that her favorite drink was Kahlua. “Kahlua!” she sang happily. “Kahlua! Kahlua!” All eyes turned to me, the adult clearly responsible for turning this adorable child into a souse. I’m sure she’d never tasted Kahlua in her life, but she did know how to get a reaction. Princess Amanita definitely embodies some of her edgy persona. Prince Florian is a lot like my son, who is a pretty gentle soul. Aside from Princess Amanita, do you have another favorite princess or fairytale? I was raised on the Oz books which feature the wise Princess Ozma, the girlish princess who started out as a boy (just in case you thought there were no transgender characters in classic children’s books). But probably my favorite princess tale is E. Nesbit’s Melisande, about the princess whose hair won’t stop growing. Melisande is a very sensible princess and the story not only features three white roses, but also a very nice prince named Florizel. What did you think when you saw Valeria DoCampo’s illustrations? I thought, “So that’s what nose flowers look like!” Valeria had found a way to make them look so perfectly botanical – like some kind of sub-tropical orchid, but perfectly recognizable as sneezing, snorting noses, too. What do you love most about writing books for kids? Children’s literature is pure storytelling. When you write for children, you write entirely for the purpose of creating a moving, exciting, rewarding experience for the reader. You’re not writing to impress anyone, or to give anyone something to discuss in their graduate seminar. You’re writing to have fun – and to create fun. What could be better? Reading a book together is pretty much the coziest experience you can have with another human being. Not only are you snuggled up together in bed or on the couch, but your minds are snuggled up too – you’re sharing a whole world together. Those worlds will become touchstones and common references forever and ever. And when you share a book that you love, you’re letting someone else see a little bit of the inside of your head and heart. You’re saying, ‘This is what moves me,’ or ‘This is what interests me,’ or ‘This is what I think is funny,’ or even, ‘This is how I wish I could be.’ And your child is saying the same to you. Do you have any suggestions or tips for helping reluctant readers learn to like reading? Read aloud! We get very hung up on independent reading, which means that we’re confusing the mechanics of reading (decoding, phonics, etc.) with the content of reading. Books that we have read to us often go much deeper than books we read ourselves and kids who are social by nature are more apt to enjoy a book that’s read together, even if they can read it perfectly well themselves. Find a book you think your kid will like and read it aloud together, or listen to a recording of it on your next long car ride or cross-country flight (the double headphone jack is key here). I spend so much time hunched over a computer that I try to spend the rest of my time outside and moving! I love taking long bike rides, swimming, kayaking and hiking and I also do yoga. I love urban walks too, particularly walking around Oakland’s Lake Merritt, where I almost always see something remarkable, whether it’s a cowboy wedding or an osprey with a fish in its mouth. I’m also a huge baseball fan and am always happy to watch a game, whether it’s my beloved Oakland A’s or my son’s tournament team. I'm currently working on several new picture books as well as my first middle grade novel, called The Roving Trees Railway. Which one will be ready for publication first is anybody's guess! Thank you so much Jim and Dashka for your very thoughtful answers. I wish you both the best of luck with these books and your future books. I am honored to participate in the tour. © Jill Tullo and The Well-Read Child, 2007-2012. Unauthorized use and/or duplication of this material without express and written permission from this blog’s author and/or owner is strictly prohibited. Excerpts and links may be used, provided that full and clear credit is given to Jill Tullo and The Well-Read Child with appropriate and specific direction to the original content. The product links in this post are affiliate links. With every purchase you make through clicking on these links, you are helping support The Well-Read Child.